The workshop is limited to 10 attendees, so reserve your spot today. Payment plans are available. Registration includes thousands of flowers, a toolkit, accommodations, meals and snacks, professional photos, and our industry-leading floral design training. Each attendee has their own set of tools to take home. You'll also have access to your own 6' design table on open studio days, buckets to use for a lift as you create, a lazy Susan, and seating to make arranging comfortable and fun. In this workshop, you will learn Kelly's step-by-step system for offering wedding florals—both the business-side and floral design. This workshop is appropriate for all experience levels; it’s an excellent intro for beginners or refresher for business owners looking to increase time efficiency. - Kelly’s exact templates and processes she’s used to gather and filter inquiries, create estimates in 15 minutes, design proposals, and put together flower orders for standard-sized events in about an hour. You’ll leave with copies and templates you can model your own documents after! - What-ifs in floral business work, client communication, and contracts. Again, you’ll leave with copies you can develop into your own. - Mechanics and design for arbors, bouquets, centerpieces, boutonnieres, wrist corsages, and crowns—you’ll also have plenty of hands-on design time. - How to implement your business and design plans elegantly and efficiently with a team. - An open studio day (everyone’s favorite! )—design to your heart’s content from an abundance of local flowers. Kelly will meet with each designer individually to discuss their goals for the day. Focus on your own goals, create in the style you want, and receive one-on-one coaching throughout the day. Save with one payment of $2,895 to secure your spot, or pay 7 monthly payments of $449 when you sign up in April. If you sign up with a friend, you each receive $200 off your registration! Have your friend also use this link, and you’ll both save! You'll be hard-pressed to find a better value in hands-on floral education. Kelly has helped over one hundred people navigate the next steps of their floral businesses through this workshop—from beginners exploring the career to experienced pros almost on the edge of burn-out. For some, this workshop is a design renaissance of sorts, and for others, it’s clear direction for a new path. Kelly’s curriculum equips you for success in your business, and you’ll be able to ask her questions long after the workshop has ended via the Team Flower Community. At the workshop, you'll not only learn not how to build stunning arrangements, but you’ll also learn to read arrangements and think critically about floral design. In this safe setting, you’ll receive personalized attention each step of the way and enjoy a tight-knit community of fellow flower lovers. With just 10 attendees, this workshop is designed to increase the intimacy and depth of your experience. And all accommodations are included, with all meals and snacks Monday through Wednesday provided! The Inn at Ragged Edge, a resort in beautiful Central Pennsylvania that will foster relaxation and inspiration for our time together. Arrive Sunday, between 7:30–8 p.m. Sessions and meals take place on Monday, Tuesday, and Wednesday. Depart Thursday, between 8–10 a.m. The workshop and accommodation location is easily accessible from major Pennsylvania cities, as well as NYC, D.C., and Baltimore. Once the workshop is finished, you can take time to extend your trip to visit one of the vibrant East Coast cities! Chat with us by clicking the red round button on the bottom right. Looking for photos from past workshops, reviews & more? Click here to read past attendee reviews. Practically speaking, you'll arrive and enjoy some refreshments with the group. We've got an ice-cream tradition going, but we will be stocked with plenty of veggies and snacks to meet a wide range of tastes and needs. Mornings are quiet and reserved for you to catch your breath and connect with your staff back home if needed. We start at 10 a.m. each day and have a relaxed programming schedule so we can go deep into the group's unique needs, taking breaks along the way. Typically, teaching days wrap up with dinner ending around 8:30–9:00 p.m.
What if I’m New to Flowers? Attendees at each workshop have a wide variety of experiences and backgrounds. If you're brand-new to flowers, you might feel a little nervous about coming, and that's okay. This is not out of your league. There's no fancy terms you won't understand. You're with friends here. Kelly works with a lot of beginners, and she knows the common roadblocks. We're going to get you over and through them at this event. You are welcome here, and you belong in this safe setting. We're all learning, all experimenting, and all thinking about what's next. To ease your concerns a little further, Kelly has created some online trainings that cover the basics. They’re 100% free when you register for the workshop. Check out the 5 exclusive online lessons. All meals and snacks for Monday through Wednesday are included in registration and menus will be available to review prior to the event. While we work to accommodate all dietary needs, it is a group setting. If you have a complicated dietary need (like Kelly), you are welcome to shop a local market and prep meals and snacks to bring in. Refrigerator and kitchen access will be provided. Are There Discounts or Payment Plans Available? Workshop payment plans are made up of equal monthly payments, with the first payment made at purchase and payments continuing automatically until you’ve made seven payments. Signing up for any workshop with a friend? Get a $200 off your registration when you both sign up together. When I Attend a Team Flower Workshop, What Am I Supporting? 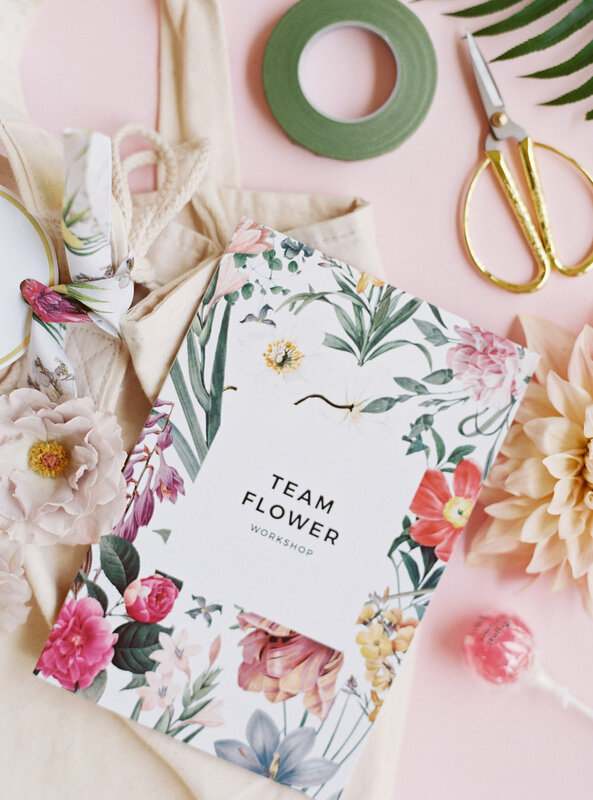 When you attend this workshop, you are, of course, supporting Team Flower, a small business with a big dream to see the world brought together through flowers—and you’re also supporting your own small business or career by investing in professional development. Check out our mission, vision, and core values to learn more about what we stand for as a company.